Steel, LLC was founded in 1947 and is located in Scottdale, Georgia, just outside Atlanta near Decatur. Our Company is a leading steel fabricator located in Atlanta, providing structural steel, miscellaneous metals, ornamental metals, erection, and services to general contractors, owners and developers for the construction of commercial, government, industrial and educational projects. Steel, LLC provides steel to general contractors across the nation with whom we have developed strong and long lasting relationships. The company specializes in suburban mid-rise office buildings, corporate campuses, aviation/aerospace structures, and steel trusses. 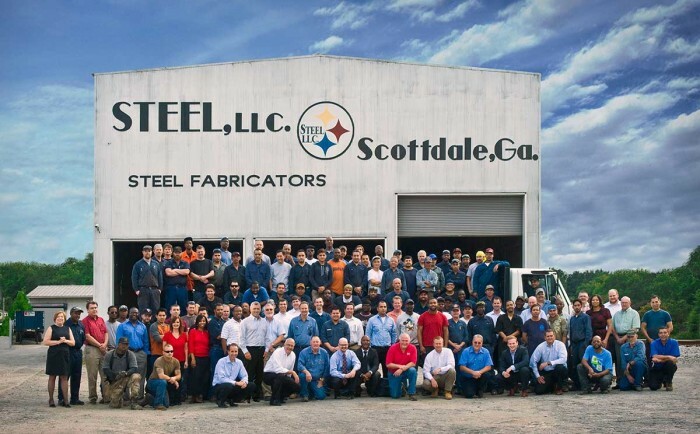 Steel, LLC produces fabricated steel to frame all types of conventional and complex steel building structures. This includes, but is not limited to, columns, beams, trusses, and plate girders. Miscellaneous stairs and rails, steel joist, steel decking, ornamental metals, and in-place erection are also services generally included in Steel, LLC’s scope of work. These services are performed by Steel, LLC or supplied through a network of experienced and reliable sub-contractors and suppliers. The company delivers its services through the bid market as well as the design build market. Steel, LLC is AISC certified in conventional steel structures and complex building structures with a sophisticated paint (multiple coat system) endorsement. The company has experience in a wide range of construction projects such as commercial, industrial, office buildings, regional shopping malls, power plants, distribution centers, pedestrian bridges, hotels, public schools, college campus buildings, sports arenas, parking decks, convention centers, aviation structures, and more! There are many customers throughout the nation with which we have strong relationships that help us win jobs. We devote countless hours to understanding each project and the challenges you face in getting it off the ground. We pay special attention to ensure we have the appropriate resources and work closely with all team members to facilitate communication amongst the contractors and management teams.